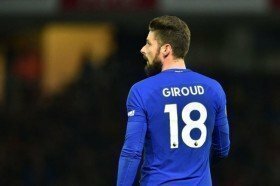 Chelsea striker Olivier Giroud has hinted that he could pursue a fresh challenge away from the Blues at the end of the ongoing campaign. The Frenchman joined the Blues from arch-rivals Arsenal during the winter of 2018 but he has since struggled for consistency upfront with just four league goals from 31 appearances. Amidst his struggles, the west London side have gone onto pursue another striker in the form of Gonzalo Higuain and Giroud has acknowledged that may tempt him to head through the exit door. Speaking before Higuain's arrival at the Bridge, he said: "If the club decides to get another striker, like Higuain, it will certainly darken my future at Chelsea. I've never said no to a return to France. Lyon and Marseille are two great clubs. My priority is to stay in the Premier League though." Higuain was afforded with the starting role during the recent FA Cup fourth round tie against Sheffield Wednesday and the same may continue in midweek where the Blues are scheduled to face Bournemouth in the Premier League.